Whether you're getting married in a church or synagogue, on the beach or in the backyard, you'll definitely want to plan ahead when it comes to the decor of the aisle you'll be walking down. 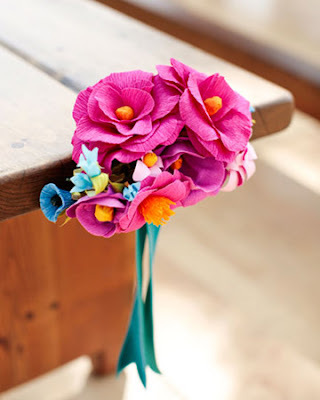 While your first thought may be to buy fresh flowers or other pew decorations from your florist, going that route can unnecessarily add hundreds, if not thousands, of dollars to your budget. 1. Bows are the traditional embellishment for wedding pews because they add a feminine touch and act as a beautiful frame to the aisle. There are an abundance of choices in terms of style, color and materials, from a simple, traditional white or ivory satin bow to more elaborate, trendy multicolored bows made with the accent colors of your wedding theme. Choosing florist satin ribbons instead of wired satin ribbon bows will cut the price tag down by 50 percent or more, without compromising on the beauty and elegance of your bows. 2. Tulle, or florist netting, is also a great, traditional choice for wedding decorations. You can make elegant tulle pew bows using several yards of tulle per bow for a full and dramatic look. Tulle is available in white or ivory and many fashionable colors that you can use to match your wedding color theme. 3. For added drama, use tulle to drape between the rows to create a signature look. Depending on the width of the tulle you select, you can purchase tulle for pennies a yard, making it a very cost conscious choice. 4. Silk florals in simple arrangements or bunches, either alone or teamed up with a bow or other embellishment, are also a budget friendly alternative to fresh flowers. Be sure to buy better quality silks that have a realistic look to them. You'll pay a little bit more for the florist quality stems than those that you purchase at a discount store but the cost will still be significantly less than using fresh flowers. 5. Kissing balls, also known as pomadors, made with artificial mini roses or pretty silk greens make a lovely, understated embellishment for chairs at an outdoor or beach wedding. 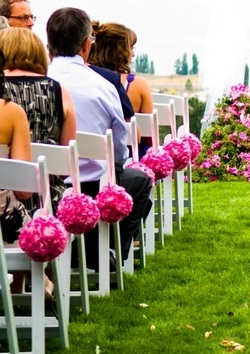 As its name suggests, a kissing ball is a round ball and is usually tied with a satin loop bow that you can simply slip over the side the chairs lining the walkway. Ready made kissing balls are available for purchase on the Internet or you can make your own using mini flowers and Styrofoam balls available at most craft stores. Whatever option you choose, you can definitely trim hundreds of dollars off your wedding budget with proper planning, a little effort and some creativity mixed in.